Picking a WordPress hosting website is more important than most new bloggers realize. Spend a little time to understand your options. Your blog doesn’t just magically appear on readers’ computers when they visit, it has to be stored on computer hardware called a server. Doing this means buying a hosting package from one of the WordPress hosting websites and is one of the bigger decisions you’ll make as a new blogger. A good WordPress host can make all the difference for your site, delivering your blog to readers quickly and with no downtime. It can also affect your search ranking in Google, making it critical that you check out different hosting packages before getting started blogging. Not all WordPress hosting sites are created equal. While most basic hosting packages are similar, all offer different features and options that may or may not work best for your site. Check out the six best WordPress hosting websites below to help decide where to start your blog. After finding a host, don’t forget to read our super-resource guide on how to start a blog. The first thing you need to understand about WordPress hosting websites is the difference between shared hosting versus managed or dedicated plans. Shared hosting means your website will be on a server with many other sites which means it might not load as fast on visitors’ computers or other issues may occur. It’s not usually a problem for new blogs because the websites sharing a server don’t have much traffic so the server doesn’t get overloaded and slow down. Of course for the ability to jam many blogs onto a server, the hosting companies cut you a sweet deal on the price. Most shared hosting packages start around $4 per month and you can gradually upgrade to a server with fewer sites as your blog grows and requires more of the host’s resources. Managed or dedicated hosting packages are where your website is the only one on the server for maximum resources but at much higher prices. I almost always recommend new bloggers start out with a shared WordPress hosting package. It allows you to see how you like the hosting company and how you like blogging without committing to a larger commitment. The basic hosting plans will usually be all you need for at least the first year of blogging. GoDaddy is the most widely recognized WordPress hosting website and the largest domain registrar in the world. Personally, I think they should spend a little less on Super Bowl commercials and maybe give that money back to customers but the site does offer the best bang for your buck. 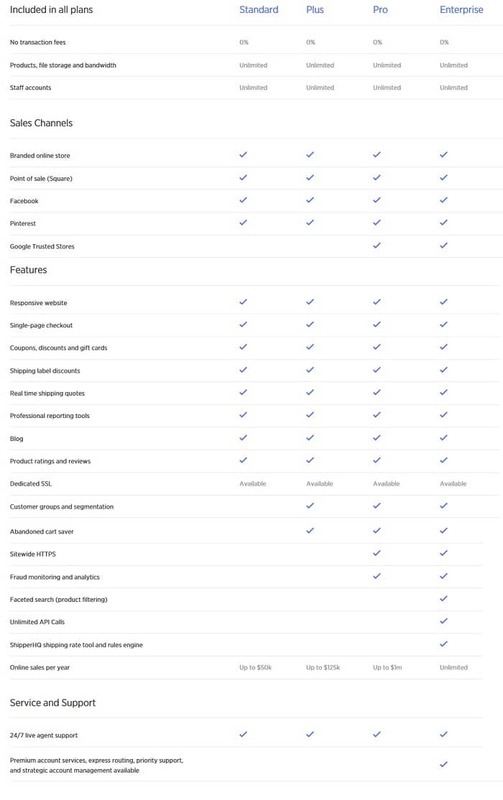 GoDaddy is a good example of why you should check out all the WordPress hosting sites to see which fits your specific needs. GoDaddy hosting supports the highest traffic of any comparable packages on other hosting sites but they lack in the allowable websites. 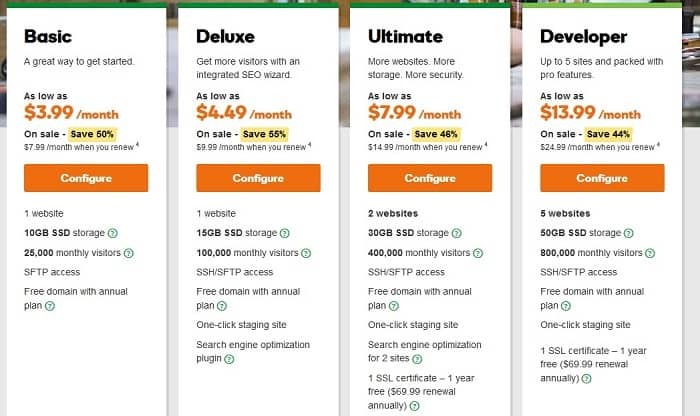 This is fine for someone that just wants to run one or two sites, you might be on one of the less expensive GoDaddy packages for years without needing to upgrade. If you want to manage multiple sites though, you’ll need a different provider. GoDaddy also offers higher storage than most other webhosting sites and the sitebuilder software is very easy to use. I was on GoDaddy for my very first website when I launched my freelancing services back in 2010. Customer service is about the best I’ve seen and available through chat or phone. Blue Host is where most new bloggers start with WordPress hosting because the website offers some of the most inexpensive fees available. All Blue Host plans include unmetered bandwidth which affects how fast your site loads, while other hosting websites limit your bandwidth on the starter hosting packages. Another big bonus on Blue Host packages is the ability to park domains and have sub-domains which allows you to have different niche sites on top of your main website. It’s a convenient way to get around the websites limit on the basic WordPress package and still have different sites you can try out. The downside to a great price and other features on Blue Host is that their customer service is badly lacking. I started my blogs on Blue Host but changed because of the customer service. Service by email is ok and usually answered within 12-hours but it can take up to half an hour to get someone on the phone. If you don’t need the help on your site, it might not be an issue for you. I know people that have had their websites on Blue Host hosting for years and have had no issues. iPage isn’t as well known among WordPress shared hosting packages but comes in with an inexpensive offer for basic hosting services. 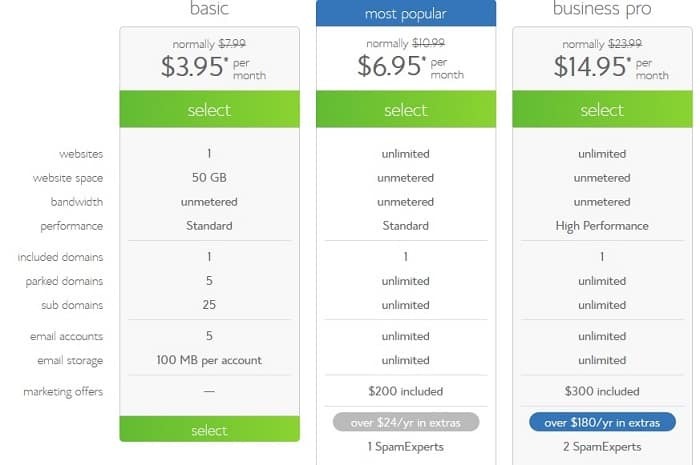 The starter package starts at just $3.75 per month and the step-up level isn’t too much more expensive. A lot of new bloggers like that the starter package comes with pre-installed plugins and hand-picked themes to choose for your new website. The plugins and themes are all available on other hosting site basic packages and can be easily installed but it’s always nice to get stuff done for you. You also get $100 in free Google Adwords credit and some free tools to manage an online store on your site when you get the iPage basic WordPress hosting package. If you’re planning on launching a bigger blog or just don’t want to move your blog around when it outgrows your host, it pays to check out some of the hosting websites that can handle higher traffic. Some WordPress hosting websites are just known for being able to handle more visitors to your blog, even in the starter hosting packages. It may not seem like much of an issue but the time it takes your website to load when someone visits is a huge factor for Google ranking. Google wants its search results to lead to the best quality experience so people will continue to use the search engine. If your blog grows too big for your hosting plan, if the amount of visitors is too much for the shared servers to manage, then it won’t load as fast. I still recommend going with a basic hosting plan to start out but don’t be afraid to upgrade to higher plans after six months or a year. You’ll notice that your site loads faster and so will Google. 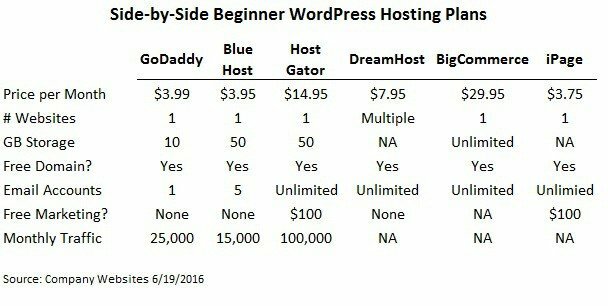 Host Gator starts slightly higher on its WordPress hosting package but offers some additional features that basic packages on other sites don’t include. The basic WordPress hosting package will support a website with traffic up to about 25,000 visitors a month like the GoDaddy hosting package but includes five times more storage. For $2 extra a month with the HostGator blog hosting package, you also get $100 in Google Adwords credit to advertise your new site and unlimited email accounts. The extra email accounts feature on the HostGator package may not seem like much but it comes in handy when you need different emails for people helping with your blog. Another big bonus to choosing HostGator for your WordPress hosting is the free site migration. If you started with another WordPress host or if you buy a blog off someone, HostGator will move your site to their servers for free. That would cost between $25 and $50 if you had to hire someone to do it. DreamHost only offers one package for shared WordPress hosting but the managed hosting package is fairly inexpensive as well. The shared hosting is more expensive than other website hosting sites and really doesn’t include many bonuses but the managed WordPress hosting costs just $16.95 per month. You get professional-level hosting for the same price as other sites charge for their second or third-level shared hosting packages. There are special considerations if you want to sell products directly from your website. You can still post an online store on a regular shared hosting plan through most sites but you’ll need a plugin for the shopping cart which may not work very well or may require customers to click through to many different pages. The more times someone has to click to buy a product or service, the more likely it is they’ll give up and you’ll lose a sale. That’s why some hosting websites specialize in online stores and features to help you make sales on your site. They’re usually more expensive than just standard hosting plans but include a lot of extra features in addition to basic WordPress hosting. BigCommerce isn’t strictly for WordPress hosting but specializes in hosting and services for online stores. If you plan on really selling products through your website, as opposed to just linking your products and then selling through sites like Amazon, then you need to take a look at BigCommerce. The basic website and hosting package is quite a bit more expensive at $29.95 per month but includes a ton of extras needed to sell products directly from the website. Besides the features for an online store, you get unlimited file storage and bandwidth which you’d have to pay for one of the professional-level packages on other hosting sites. So who wins in a side-by-side comparison of the WordPress hosting websites? It really depends on what you need in a hosting plan. Blue Host provides more storage for the price so you can put a lot of media and images on your site but you might outgrow the basic plan faster. GoDaddy WordPress hosting is great for someone that just wants to manage one or two sites because the basics plans support a lot of traffic. If you’re planning on managing an ecommerce site then make sure you check out BigCommerce. 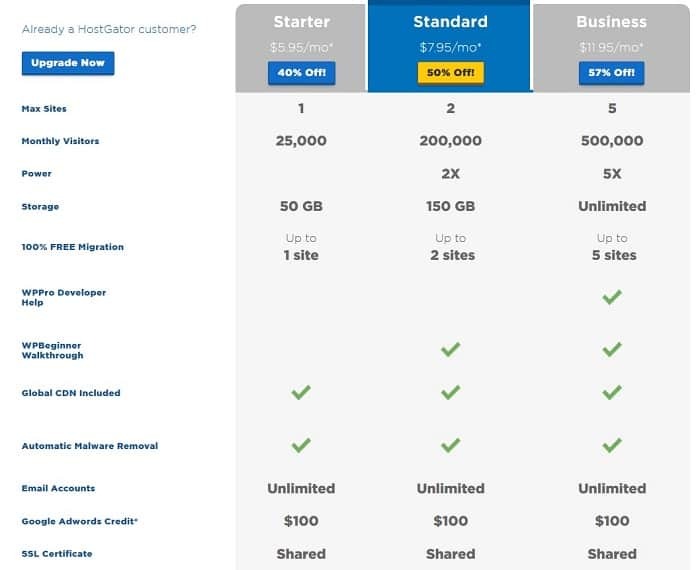 If you don’t want to change hosting plans for a long time, you might decide to go with HostGator which offers a higher traffic threshold. Choosing your WordPress hosting plan isn’t really too complicated. Most basic packages on WordPress hosting websites are pretty similar with a few differences that will appeal to some but not others. It’s more important than most new bloggers understand so spend a little time to really pick the best website hosting provider for you. this is probably the best, most concise step-by-step guide I’ve ever seen on wordPress hosting.